What makes a bad Christmas card, and why? 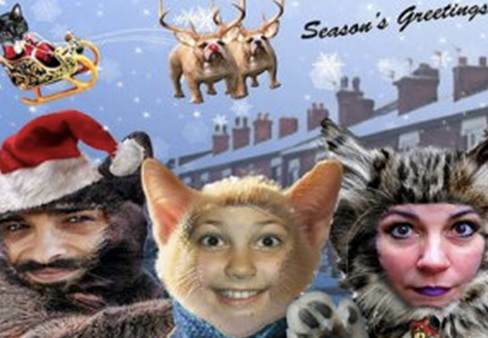 Terrible Christmas cards tend to involve misguided attempts at humour, wacky poses, and some awful Photoshopping. What might have seemed like a good idea at the time often ends up being head scratchingly bizarre. 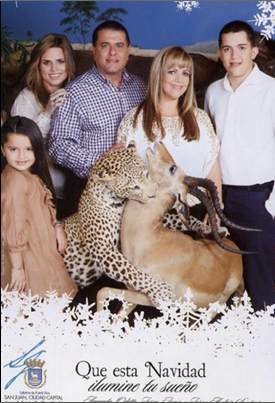 Jorge Santini, the Mayor of Puerto Rican city San Juan, decided that his official family Christmas card for 2011 should promote a local zoo and wildlife sanctuary. The result: pictures of his family sanding over some bizarre scenes, with the best being a jaguar mauling an antelope, with the family standing nonchalantly in the background. It’s quite hard to tell what’s going on in this photograph. Is the father naked, and if so, why? Moreover, didn’t anyone look at this photograph before it was turned into a card, and perhaps think that it wasn’t the best idea in the world? The sort of card image that’s going to come back and haunt someone in the future, or at the very least disturb them in the present, this circus themed card is wrong on many different levels. There’s probably a good explanation behind the design behind this card. The idea was probably suggested by the child in the middle, which may explain the somewhat less enthusiastic look on the faces of the other two participants. 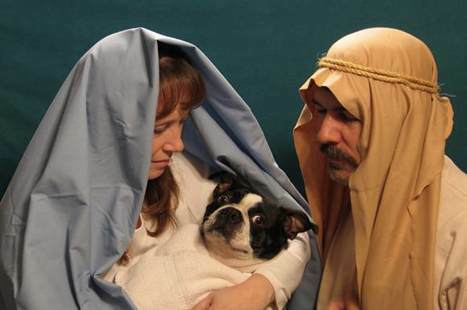 My personal favourite, this nativity scene is defined by the look of mortification on the dog’s face. Probably the pinnacle of pets being unwillingly dressed up for the Christmas season by their owners. While these cards may be in questionable taste, there are many ways in which people can design great looking cards without having to resort to stupid pictures. Some of the best ways to achieve this is by taking a traditional design, rather a photograph, and work around that with personal messages and touches. An image may be used, but not as the focus of the overall card – group family photographs on Christmas cards rarely manage to look good. Handmade cards represent one option, and have the potential for being more personal if you’re only planning to send out a limited number of cards to people. For when you do need to send out a lot of cards, many Internet services provide templates that can be printed out and sent, or modified online for you to send as e-cards, or to be posted free of charge. The upside of doing this is that you still have a unique card, but one that has a high quality finish. Moreover, doing so means that you aren’t taking the risk of making a card that’s as outright disturbing as the ones above. Sebastian is working with Vistaprint promoting their wide variety of christmas cards. They also offer a personalised Christmas card service, although I’d suggest putting more thought in to your image than the unfortunate subjects of this blog post. This was great if not a little disturbing! 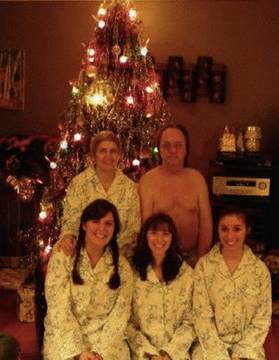 I think some of them could be combined to make the most hideous Christmas cards ever! 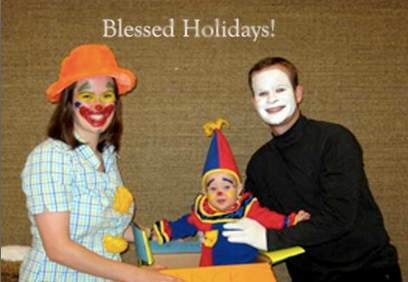 Dress the mayor’s family up in the cat costumes in the same pose with the Jaguar mauling the antelope, for example.Combine the clown family and the naked dad family for the most disturbing of all Christmas cards. Send them to those people you only pretend to like. @raeme67 Hehehehe true true! How about disguising the jaguar as a clown and have the French bulldog bite him? Daniel Nest The combinations are endless! That is a scary thought!